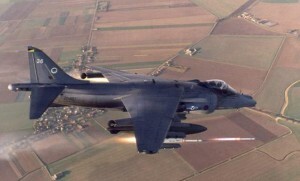 A group of British flag officers has written an open letter to the UK MoD urging them to reconsider the recent decision to retire the UK’s fleet of Harrier strike fighters, a move which they say will leave the UK without a carrier borne fighter for almost a decade and leave the UK’s few remaining outposts such as the Falkland Islands vulnerable. The letter, published in The Times, says the move will “practically invite” Argentina to make another attempt to take the Falklands, which they captured and were then evicted from by a UK naval task force in 1982. “We believe that these decisions should be rescinded in the over-riding national interest, before it is too late,” the letter said. But what the letter did not take into account is the deterrence value of the detachment of RAF Eurofighters now permanently stationed on the islands and supported by tanker aircraft and a regular air bridge to the UK, something which did not exist in 1982.